Located on the west bank of the Lunga River, opposite Henderson Field. They have an interesting collection of gear, aircraft relics, artillery, rifles, helmets, grenades, field equipment, plus one of the original US tractors from Henderson. 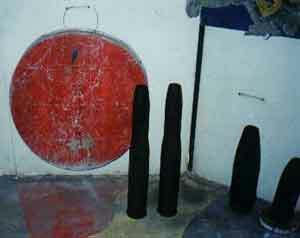 Three Japanese 37mm AT guns. Machine Gun Collection: Modern Threat? 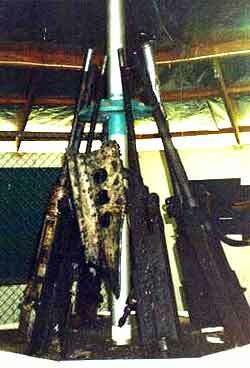 In 1996 that they had taken the machine guns out of the collection and secured them. It seemed that any weapon not nailed down was liable to be stolen by the Bouganvillians for their struggle with the Papua New Guinea Government, and some of the guns were in very good condition! Belonged to Marine Scout Bombing Squadron 132. On December 1st 1942 Captain William S. Spang crashed it into trees attempting a night landing. Captain Spang was killed, but his gunner survived. The engine lies nearby. They also have a SBD and a P-400. 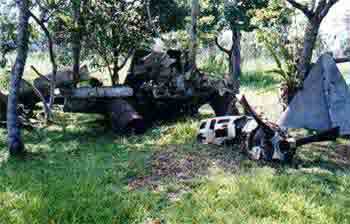 A storm in 1998 brought down a tree branch that knocked the left wing off one Dauntless, exposed the wing fuel tank and knocked the P-400 from its stand. 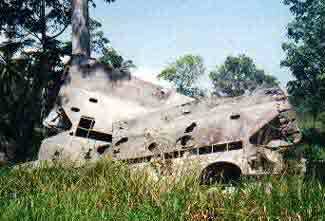 Crashed in the Marovo Lagoon after a bombing raid on Rabaul. It looks like it was lying on its right side and the armour had rotted . This could be one of 13 landed in October 1942 or maybe brought in later by New Zealand troops.